Hydronic or Electric Heated Driveway? Which is Best for You? Hydronic radiant heating is a proven method for warming floors as well as heating driveways and other snow melting applications. Hydronic floor heating systems utilize a mixture of hot water and propylene glycol (anti-freeze) that circulates through a closed-loop flexible polymer (PEX) tubing that is installed under the floor surface. The liquid is heated by a centrally located water heater (boiler) and then circulated through the PEX tubing by a series of pumps to warm the floor. The special hot water and anti-freeze mix retains heat for a long time after the boiler shuts down, so hydronic heating systems are energy efficient and environmentally friendly. Look for systems that utilize highly efficient condensing boilers with an Energy Star Rating as well as top quality pumps, valves and tubing. The condensing boiler (water heater) can be powered by any energy source, including natural gas, electricity, oil, wood, or even solar collectors. This helps to minimize operating costs. The materials, techniques and technology of hydronic radiant heat systems have dramatically improved in recent years. 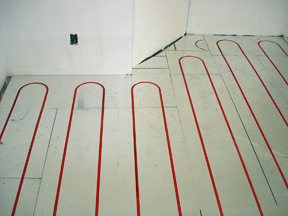 Hydronic floor heating systems utilize PEX tubing that - until recently - was often installed in a concrete mass called Gypsum Concrete or "Gypcrete". This method works very well in most applications, but the development of lightweight aluminum RauPanels™ and low-mass, modular board underlayment systems (InfloorBoard), mark a significant improvement in hydronic heating technology. The use of Rau Panels and Infloorboard have also made hydronic systems much easier to install nowadays. These hydronic floor heating systems can be installed in most remodeling applications as well as new construction projects. Several options are available when it comes to hydronic floor heating systems, but the latest, most recommended hydronic underlayment system features the lightweight aluminum RauPanels™. The light weight of these aluminum panels minimize the floor's load bearing and the highly reflective properties of the aluminum makes it a very efficient hydronic floor heating system. RauPanels not only simplify the installation process, but these panels have proven to be the most effective and efficient material for hydronic floor heating. 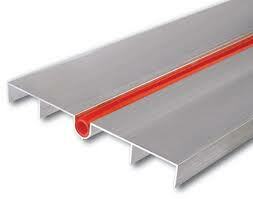 The aluminum RauPanels (pictured left), as well as the modular Infloorboard panels, have readymade grooves for the PEX tubing, so rather than embedding the hot water tubing in the concrete slab, the PEX tubing is placed in the grooves of the pre-cut panels. Although RauPanels are regarded as the most effective hydronic underlayment system for most applications, Infloorboard and Gypsum Concrete (Gypcrete) are still used. Talk to a radiant floor heating expert for more information about these systems and learn which hydronic floor heating solution is best for you. Because of the relatively low cost of natural gas or wood, hydronic floor heating systems can offer lower operating costs, so they are often recommended over electric systems for large floor heating applications. Electric radiant heating systems are still regarded as the best solution for small and medium floor heating projects. Warmzone is a trusted radiant heat provider with experienced hydronic and electric floor heating designers and engineers. Their staff is good about answering questions and explaining more about hydronic radiant heating systems without any obligation or sales pressure. To speak with a hydronic specialist, call 888.488.9276. You may also submit your project information and receive a free hydronic floor heating quote. © BEST HEATED FLOOR SYSTEMS AND PROVIDERS. All rights reserved. Various trademarks held by their respective owners.